Everyone loves mystery, and a real-life unsolved puzzle is far more fascinating than any fictional one (even if you do get the answer in a work of fiction, and not in the real-life one); it is, isn’t it? There are all sorts of bizarre things that have happened, some of which make up the unsolved mysteries of the world; from puzzling coded texts no-one’s been able to decipher to showers of vegetables falling out of the sky. With lots of documentaries on strange events, some of which have been solved while explanation to some others can only be attempted by unimaginable and highly speculative theories- here’s a selection of those unsolved mysteries of the world. In 1979, the Southampton house of Mr Moody was suddenly deluged by seeds of mustard and cress pattering onto his greenhouse, apparently simply falling out of the sky. The next day it was bean, corn and pea seeds and his neighbours either side got some, too. This happened again and again for some time, then eventually less often and finally it stopped, after 25 separate ‘falls’. Mr Moody gathered eight buckets of cress seeds over that time and ten pounds of beans were collected between the three gardens – but no-one has been able to find out where the seeds came from, then or now. Apparently, the seeds grew into very good quality produce, though! These are various encrypted messages believed to have been written by a San Francisco murderer of the 1960’s/70’s known as the Zodiac Killer, and thought to have been written to taunt police and the press. The killer has never been caught, although the last known Zodiac murder was in 1970; and of the messages he sent to the police and the press, only one has been cracked so far. Between 1966 and 1974, the Zodiac killer provided more than 20 written communications with the press and police officials and including other ciphers that have not been cracked to this day, making them part of the unsolved mysteries of the world. William Hackler was a farmer in Odon, Indiana and one morning in 1941, he had just left the house when he smelled smoke and hurried back in to find a fire that apparently started inside a bedroom wall. Back then they had no electricity, so this was very strange! The volunteer fire services arrived and put it out, but then things really started to become weird – as the firemen left, a second fire started from inside a mattress, then another that apparently started between the covers of a book and for the rest of the day, fires just kept breaking out all over the house – even some under the very noses and eyes of various astonished people! In all, twenty-eight apparently spontaneous fires popped up over that day, then they just stopped, and Mr Hackler was so discomposed by it all he tore down the house and rebuilt it from scratch. This seems to have worked, as nothing like it ever happened again, but nor were the fires ever explained. 4. So Maybe Someone Is Out There? – The Wow! Signal! Many people may remember the SETI (“Search for Extraterrestrial Intelligence”) project, where people all over the world donated spare computer time to assisting in recording and analyzing any possible messages coming in from outer space. However, in all the signals looked at, only one came close to possibly being the real thing – that is, an actual message from somewhere other than the earth. In 1977, SETI volunteer Jerry Ehman was scanning radio wave signals coming in from space looking for signs of possible intelligence when he saw spikes on the measurements. Over 1 minute 15 seconds (the maximum time his array could measure) Jerry watched as the system recorded the powerful signal, apparently from Tau Sagittarii, 120 lights away in the constellation Sagittarius – and wrote “Wow!” on the printout, hence it has since been known as ‘The Wow! Signal’. No-one’s ever managed to locate it again, however, so scientists have had a field day trying to explain its meaning and origin! One of the unsolved mysteries of the world took place in early 1846 when a 14-year-old Angelique Cottin suddenly started having a strange ‘electric’ effect on objects around her – furniture would float through the air, chairs move away as she tried to sit on them and a weaving frame even danced around a room! Her body would also move suddenly and wildly, apparently without her consciously doing anything, to such an extent she was injured a number of times. Although her parents suspected she was possessed, their priest was unable to do anything and denied this was the problem, so instead, the parents put Angelique on display and charged people to come and see her! However, just three months later the strange ‘electric’ effects stopped as suddenly as they had begun, and they never returned neither were explained. Tamam Shud, meaning ‘finished’ or ‘ended’, was the final line of Omar Khayyam’s poem collection ‘The Rubaiyat’, so when an unidentified man’s body was found in Adelaide, Australia in December 1948, with this phrase written on a scrap of paper sewn into his trousers, police were totally stumped. What’s more, they’ve stayed that way, since the man was never identified and the puzzle never solved, remaining to this day one of Australia’s most profound mysteries. Fifteen-year-old Margaret Foos could see perfectly well, but discovered that she was also able to ‘read’ books while blindfolded, through touch alone. Her father encouraged her to practice this ability and she became able to identify colours and objects along with playing games like checkers. Foos believed his daughter was demonstrating a way blind people might ‘see’ through touch, a kind of extra-sensory perception, and took her to be tested by psychiatrists in Washington DC – tests which she passed with flying colours even through a ‘foolproof’ blindfold the doctors provided, and when her father was not in the room (two possible explanations for which the doctors were checking). The doctors were baffled and never managed to explain how she did it, but nor is anyone else known to have developed the ability. However, one has to wonder – how did Margaret, a normally sighted person, discover she could ‘read’ blindfolded in the first place?! It is nothing but one of the other unsolved mysteries of the world. 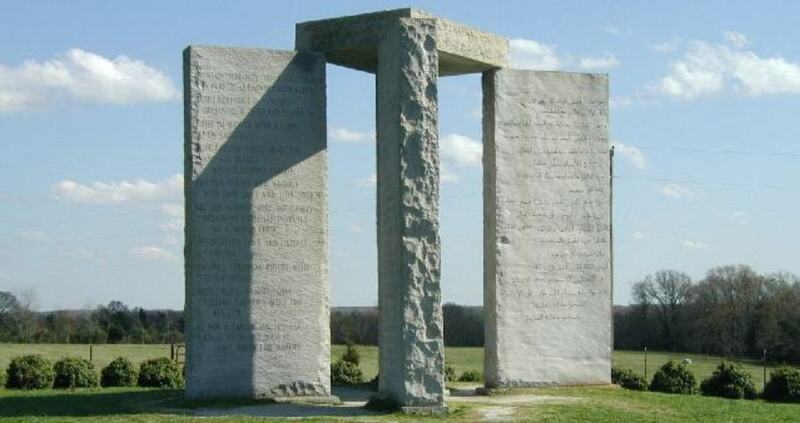 The American Stonehenge is a granite monument erected in 1979 in Elbert County, Georgia, properly known as the Georgia Guidestones. Lining up with some astrological features, they have inscriptions in eight different languages, from Russian to Swahili and Chinese, spelling out the “new” Ten Commandments that should bring the world to an ‘Age of Reason’. No-one knows the real identity of ‘R C Christian’, the anonymous person who commissioned them; nor is it known where they came from or why they were put there, but the commandments are rather controversial. The first states that humanity should be maintained ‘under 500 million’ in order to keep in balance with nature – which some have taken as a license to kill off enough people to get the numbers down! Not surprisingly, therefore, some critics want to pull them down and destroy them, but so far they’re still there. In November 1927 a series of incidents started terrorising the residents of New Jersey as pot shots were taken, mostly at various vehicles and buildings, shattering windows and windscreens and occasionally hitting people. However, no-one was ever seen carrying out these incidents, only once was a shot heard being fired and despite thorough searching of the scenes, the bullets that caused the damage were never found. The incidents stopped again just as suddenly in 1928 and neither the phantom sniper nor any of his ghostly bullets were ever found, despite extensive police investigation. 10. The Puzzle Book to End All Puzzle Books! In 1912 a Polish-American antiquarian bookseller called Wilfrid M Voynich acquired a 240-page manuscript book filled with drawings and diagrams of strange things, events and even plants that do not match anything known – and the text is in a totally unknown script or language that no-one has managed to decipher. Known as the Voynich Manuscript, nothing more about its origin or purpose has ever been discovered although carbon-dating has placed its creation as around the first half of the fifteenth century. As can be imagined, theories about it are many and varied, but about the only thing most theorists agree on is that, given its age and complexity and how much it would have cost to make it, it’s unlikely to be a hoax. The more we grow in knowledge, the more we discover things that can only make us ask more questions. There are lots of unexplained events that have happened in history but we hope you enjoyed this selected list of unsolved mysteries of the world.